(Bloomberg) -- Unbowed France, a French far-left party, on Sunday started a crowdfunding plan to help finance its European Union election campaign. “Become our bank," Unbowed France, or La France Insoumise, said in several tweets, some of which included guidelines on how to pay money into the party’s accounts. “Take part in the people’s loan," it said, adding that “we guarantee you your loan will be refunded" within a year. 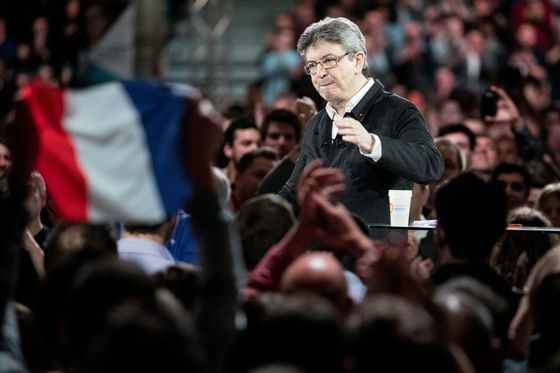 Party leader Jean-Luc Melenchon said in a video on social media that Unbowed France hasn’t found financing to cover the costs of its EU election campaign. In the run-up to the May 26 EU vote, an increasingly acrimonious political atmosphere and less reliable polling has made banks wary of getting involved in politics. French parties used to have a relatively easy time getting loans. Since the government refunds expenses up to a preset limit for any party surpassing an easy-to-reach voting threshold, loans were traditionally seen as nearly risk-free. For this year’s European campaign, parties can spend up to 9.2 million euros ($10.6 million) and get up to 4.3 million euros back just by winning 3 percent of the vote. Unbowed France has 17 lawmakers in the National Assembly and has cast itself as one of French President Emmanuel Macron’s main opposition parties. Melenchon has called for French voters to use the EU election as a “referendum against Macron." According to a latest poll by Opinionway released on Thursday, Unbowed France will get 7 percent of votes during the EU election. The party is using the finactions.fr crowdfunding platform.